REMEMBER WHEN POTATO CHIPS WERE A NICKLE A BAG? NOW A BAG TWICE THAT SIZE IS $1.19? REMEMBER WHEN A THREE POUND CAN OF COFFEE WEIGHED THREE POUNDS INTEAD OF TWO POUNDS, TWO AND A HALF OUNCES? THOSE OF YOU THAT KNOW ME, KNOW THAT I HAVE A FETISH ABOUT CHARCOAL. I COUNT THEM OUT WHEN I COOK OUTSIDE, I CLOSE THE VENTS ON THE SMOKEY JOE TO PUT THEM OUT SO I CAN SAVE THEM FOR THE NEXT TIME I COOK-OUT, I KEEP MY “USED” CHARCOAL IN TIGHTLY TWISTED WALMART BAG, I ALWAYS HAVE AN EXTRA BAG STASHED LIKE AN ADDICT STASHES CIGARETTES OR BOOZE, COME TO THINK ABOUT IT, MY CIGARETTS, 30 PACK OF MILWAUKEE’S BEST, AND MY EXTRA BAG OF CHARCOAL ALL HAVE ASSIGNED SPOTS IN THE BACK OF MY PICK-UP TRUCK. BUT LET’S NOT GET OFF TOPIC……………. A 10LB BAG OF KINGSFORD CHARCOAL NOW WEIGHS 9LBS !!!!! BUT IT’S NEW AND IMPROVED. JUST HOW THE HELL TO YOU IMPROVE CHARCOAL? CHARCOAL HAS BEEN THE SAME SINCE THE 1900’S WHEN JACK DANIEL’S USED IT TO FILTER HIS FAMOUS No.7 BEFORE PUTTING IT IN OAK BARRELS TO AGE. THE HISTORY OF CHARCOAL, AND THE HENERY FORD STORY IS NOW GONE FROM THE BAG, AND INSTEAD THE INSTRUCTIONS ARE BILINGUAL. WHY WE’RE AT, GASOLINE JUST WENT DOWN TO $.829/PINT. The excitement is mounting....the countdown is now in hours and minutes instead of days or weeks. Everyone is in a high state of anticipation!! In La Crosse that is. My son-in-law, Randy, gets home tomorrow for a 2 1/2 week leave from Kuwait. Needless to say there is one wife and three very excited little girls counting the minutes. Of course, Randy is equally excited and counting too. He will be home with his family for his 39th birthday July 9th too!! Today was a 6AM start at work...this is the hard part, the great part is getting out at 2PM. And it rained today...we just aren't used to a rainy day here, we are spoiled with blue skies and sunshine...guess I'll do some laundry. I'VE FOUND AND POSTED AN ELECTRONIC WEB BASED CALENDAR. YOU CAN ACCESS OUR CALENDAR FROM OUR WEB PAGE, OR CLICK ON THE LINK IN THE FAR LEFT COLUMN ON THE BLOG. YOU CAN CLICK AHEAD ON THE MONTHS TO SEE OUR UPCOMING PLANS. CAN'T WAIT FOR SEPTEMBER TO GET HERE !!! This blog is a collaboration of Rex and me so here goes.. We have a new web page, it is called "CeleBEARtion" and we would like everyone to look at it and we love feedback. We have 8 of the 50 bears posted. This is a project sponsored by the Chamber of Commerce, and after they are displayed this summer they will be auctioned off and the proceeds will be donated to various charities. They are a colorful and interesting addition to the local landscape. I got up early and was at the Farmer's Market at 8AM. 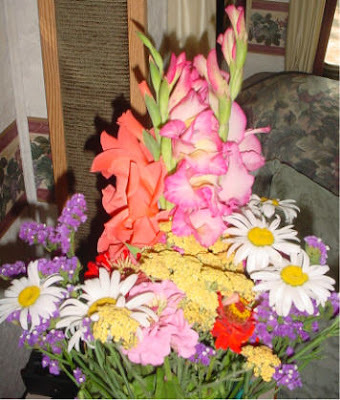 One of my purchases was the beautiful bouquet of flowers pictured below. (Rex just shared with me his purpose of flowers in the title..I am suppose to let everyone know he got up and got them for me......ya right!!) That must have something to do with the mischievous mood he selected for the day. As I look back at the page title, I guess I don't have to explain the calendar..Rex did a great job with that!! Oh the next title component is cactus..that will actually have to wait for a few minutes. I am returning to the Farmer's Market...I got fresh produce to make fresh salsa, which will be served with our fajita supper. I love a good Farmer's Market and the Lake Tahoe one is great!! Ok ..I bought cactus paddles..fortunately the vendor had a recipe and that is what I made and it is OK, but I will not be buying any more and needless to say Rex will not even try it! !Cactus has a syrup type of stuff like okra...yuck! But I will eat what I made..it is ok with the peppers, tomatoes, and onion I mixed with it. Today I got a picture of my grand daughter, Mackenzie, playing softball. She is 7 and the team they played was made up of mostly 9 year olds. They lost but only by 2 runs. Need less to say we are very proud of her!! Way to go Mackenzie!! Today is a day off so we went to the big town of Markleeville, California. Markleeville has a population of 150 and an elevation 5900. It is also home to Grover Hot Springs State Park. It is set up pretty nice with a hot spring pool and a regular pool. For a $5.00 fee you can enjoy both. Which of course we did today, it was a nice relaxing thing to do on a day off! This morning I did a dry run with our new back pack (refer to June 18 blog). I had to go to the post office and the hardware store. They are about a half mile from here, so I loaded up my pack with a 10.2# load and took off. It went pretty well but the straps cut into my arms, so I think I need to rig up some kind of strap to go across the front the hold them away from my arm pits. I am sure I'll figure it out. Tonight we are having some more of our fresh bounty from yesterday's Farmers Market trip. Fresh corn on the cob is going to be GREAT!! Today we worked 6AM to 2PM and since it is Wednesday...........we went to Carson City to the Farmer's Market after work. I just love going to the Carson City Farmer's Market!! We find such wonderful fresh produce from Northern California. As I am blogging, Rex is having a really great time making green bean soup. He just said the green beans are so fresh they squeak like cheese curds. He is in "Hog Heaven"! We also got cauliflower, celery, purple onion (also in the soup), strawberries that were picked TODAY and are just about the best I have ever tasted, corn on the cob, red leaf lettuce, and zucchini. As I already mentioned..I love Farmer's Markets! Then we did the Wal-Mart run and after coupons, spent $158.00. How does that happen for two people? I really like the food network and Rachel Ray. She uses a grill pan a lot so today we got a Lodge Logic grill pan. Of course, Rex has a rule..if I bring something in, I have to throw something out. So goodbye George Foreman grill!! Sorry you have to go to make room but such is life. He is using it to grill the bratwurst for the green bean soup...and I think he likes it!! My daughter Nikki has referred to the following picture as "the look" so here is Maxine's look for everyone to enjoy.. This is a comment on the DARK SIDE. When we left Laughlin on May 5 we went to Vegas and camped two nights and at that time, I noticed a very dry red looking mark on my neck. It almost looked a a rope burn..as in being hung...well I lotioned the hell out of it and it finally went away. Well, lo and behold..yesterday it showed up again. I am not sure if it looks like a rope burn or a garrote mark!! Do you think Rex is trying to do away with me in my sleep??? Maybe it is like voodoo and he is dreaming of garroting me or hanging me and it is manifesting itself on my neck!!!!!!!!!!!!!!!!! All I can say is ..if I turn up dead....make sure CSI is on the case!! A day off!! Yea!! There are two routes to go to Carson City from here. You can take HWY 50 which we took all last year and then there is the Kingsbury Grade, which I discovered this year and like a lot better. It isn't any shorter but it is less crowded, the descent is also steeper and shorter. In other words most of the distance covered is on more level ground, rather than mountain curves. Since I do most of the driving I like that. Anyway on the way down the mountain one day we noticed a huge structure and wondered what it was, so today Rex thought we should go up Kingsbury Grade and do some exploring. While driving around on the Grade, a smallish brown bear ran across the road in front of us and calmly crawled up the hill under the deck of a house. HELLOOOOOOOOOOOOOOOOOO......no wonder I always hear of bear sightings on Kingsbury. Last Thursday was payday and I noticed rib-eyes on sale at Safeway for $4.99 a pound, a quick trip to Safeway and Rex is having a rib-eye and now has two backups in the freezer. (He really likes rib-eyes!) A sour cream apple pie makes for a great day off menu! Rex got a new t-shirt in the mail today from my daughter, Heather. 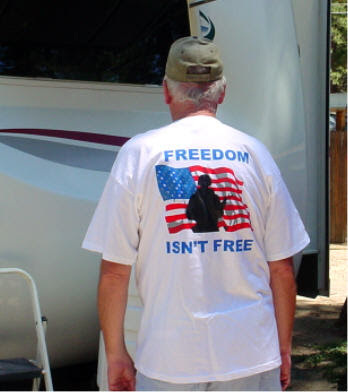 The family's of soldiers group is selling them. Heather's husband, Randy, is currently stationed in Kuwait with his National Guard troop. Rex is modeling it below. All in all a great day off!! I am thankful because I have completed day six of six days of work in a row and we have tomorrow off!! 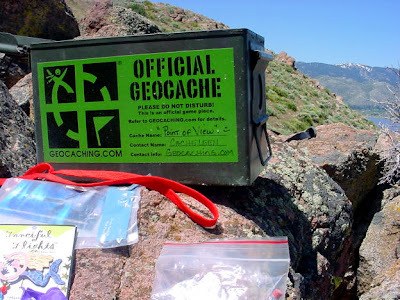 As everyone knows, we do a fair amount of hiking and of course our new thing geocaching. On these little excursions we use what we call a "day pack" to hold the camera, water bottles, GPS unit, snacks, a whistle, clock, and various other little things we think we need. Anyway I hate it...the strap to carry it is just not comfortable. I finally mentioned this fact to Rex and although he didn't feel it was uncomfortable, he felt it was getting too small for all our necessary geocaching and hiking equipment. So last Monday we went to scope out new "day packs", we found one we liked then came home to do some internet research. We really didn't find one we liked better on-line and we certainly didn't find anything cheaper so after work today we went and bought the one we liked. Now Rex is busy outfitting it. Now we need a day off without a list a mile long so we can try it out!! For all of you poker fans, we have had an exciting week at Harvey's. The World Series of Poker Tournament was there. They have one at Harvey's in February that is televised on ESPN. The qualifiers from this week, will be in Vegas at the Rio for the main WORLD SERIES OF POKER. Chris Ferguson was here also. He is a major player seen at final tables on ESPN and the Travel Channel all the time. I used to really like pizza. But quite frankly it has been years and I mean YEARS since I have bought a pizza that I felt was actually worth the money. My favorite pizza of all time was made by Pizza Villa in La Crosse circa 1975!! Ever since we got our second bread-machine (we wore out the first one), I have been thinking about using it to make pizza dough and my own pizza. So this spring, I mentioned this to Rex and he said he thought it was a good idea. Rex is an alfredo sauce kinda guy and I like red sauces so this is always a compromise. On the first one I made I think I bought both sauces and put half and half. It was good but still not right. Then Rex found a sun dried tomato alfredo sauce at the store and thought that would work. Also good but still not right. That brings us to today and I feel that I have nailed the sauce, it was soooooooo good. God I love my herb garden (refer to June 13 blog) and they were absolutely critical to my sauce. I mixed it up in my magic bullet and it was wonderful!! It consisted of tomato sauce, tomato paste, chopped tomatoes, kidney beans, garlic, parmigiano reggiano cheese,fresh oregano, fresh sweet basil, and a small amount of fresh sage. WOW!! It was perfect--a sauce with body and not runny. I am really thrilled with this pizza!!! This is a note to my son-in-law, Jesse. Congratulations....we are proud of your achievement. A year ago Jesse and two other people started an irrigation company, Tri-State Irrigation. Jesse has since bought out the other two people and has just celebrated his first year in business. At this milestone, the Better Business Bureau has recognized him and his company as one having no complaints filed. Way to go Jesse!! Keep up the good work!! Last week I caught the tail end of the farmer's market at Lake Tahoe. I didn't realize when it was so we just happened to be going by at about 1 pm when a lot of the vendors had already left and the rest were packing up, we stopped anyway because I just love farmer's markets. We got some beautiful, large purple onions to grill that night. I also got some oranges that looked kind of rough but tasted good. We also got some peaches. Unfortunately, the weather in this region has not been great this spring so the produce was not very good looking. I did not see one tomato and the green beans looked terrible. Now on to my great purchase. I have been thinking for a while I would like to grow some herbs, and lo and behold there was a guy selling plants. I got sweet basil, lemon basil, and flat leaf parsley. So Friday when I went to Carson City to get groceries, I need to get some potting soil and pots for my herbs...guess what??? I found more herbs. So now I also have sage, oregano, and rosemary. 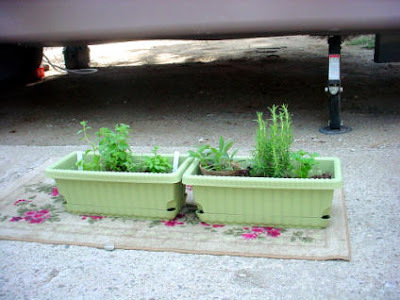 I have been using them in everything and really am enjoying my little herb garden!! TODAY WAS A GEOCACHING HIKE DAY. TODAY'S ADVENTURE TITLED "MEADOW WALK" WAS JUST THAT, AND LEAD US DOWN A BEAUTIFUL TRIAL WITHIN THE LAKE TAHOE BASIN, IN A WONDERFUL MEADOW ALONG THE TRUCKEE RIVER. THE MOUNTAINS SURROUNDING THE BASIN ARE STILL SNOW COVERED AND BEAUTIFUL. 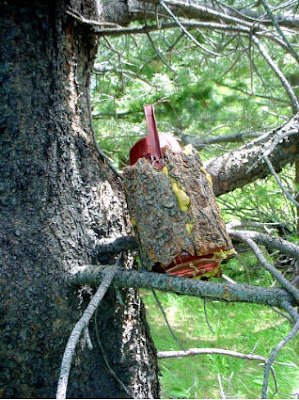 THE CACHE ITSELF WAS DISGUISED IN BARK AND HANGING IN A PINE TREE. WE WERE THE SECOND PARTY TO FIND THE CACHE TODAY AND LEFT A GOLF BALL. I have always liked solitary games. Growing up without anyone else around you do things that you can do by yourself. I have spent many hours playing solitaire, I also like crossword puzzles, and have been known to play free cell on the computer. Now I have a new one...SUDOKU. For those of you that haven't seen it, it is a game that consists of a big square made up of 9 rows and 9 columns(9x9). Within this big square are 9 smaller squares of 3 rows and 3 columns(3x3). To begin with some of these boxes have numbers in. The object of the game is to fill up as many boxes as you can with the numbers 1 to 9. Each of the rows and each of the columns must contain the numbers 1 to 9 in any order using each number only once. Easy, huh?? But wait...to make it more challenging each of the 9 smaller squares (3x3) must also be filled with the numbers 1 to 9 used only once. Not so easy now is it?? Anyway this is what I now occupy my time with while on break at work. Rex has even tried it a time or two. AS I SAID LAST WEEK I BOUGHT A HAND HELD GPS UNIT. WE TOOK A COUPLE OF UNSUCCESSFUL TRIES AT GEOCACHING , BUT FAILED. THE UNIT DOESN'T WORK UNDER THE TREES, AND STAY LOCKED ONTO THE SATELLITES. THE NEXT TRY TOOK US ONTO PRIVATE PROPERTY AND WE JUST WEREN'T COMFORTABLE SEARCHING AROUND SOMEONES BACK YARD. WE STARTED UP THE TRAIL AND THE GPS UNIT INDICATED WE WERE .3 OF A MILE FROM OUR TREASURE. AS WE'RE HIKING ALONG ENJOYING THE SPRING FLOWERS THE GPS UNIT INDICATES WE ARE GETTING FARTHER AWAY FROM THE TREASURE. I CONCLUDED WE WERE ON THE WRONG SIDE OF THE CREEK, SO WE GO BACK TO THE TRAILHEAD AND START WALKING UP THE OTHER SIDE. THE GPS UNIT INDICATES HOW FAR YOU ARE FROM THE WAYPOINT (TREASURE) AND SHOWS THE DIRECT LINE YOU SHOULD BE TRAVELING. THE GPS IS HAPPILY COUNTING DOWN THE DISTANCE, AND SUDDENLY CLICKS OVER TO FEET, NOW I'M 500 FEET FROM THE TREASURE. DAM, THIS IS GOING TO BE EASY, BUT NOW I'M GETTING FARTHER AWAY? THE GPS SAYS I'M HEADED SOUTH AND I NEED TO BE HEADING DUE WEST !!! AHHH......... DUE WEST IS STRAIGHT UP THE SIDE OF A MOUNTAIN............ I AM GOING TO FIND THAT TREASURE I DON'T CARE IF IT'S STRAIGHT UP THE MOUNTAIN!, I DON'T CARE IF IT TAKES AN HOUR, A DAY OR ALL WEEK ! NOBODY WAS HURT, BUT I DON'T THINK MARY WILL BE FOLLOWING ME UP ANY MOUNTAIN SIDES EVER AGAIN! LESSON LEARNED, THE GPS INDICATES HOW FAR YOU ARE FROM THE WAYPOINT IF YOU COULD FLY. THE ACCURACY IS AMAZING, TO WITHIN 5 FEET OF THE POINT. SUCCESS !!! I FOUND THE TREASURE UNDER SOME ROCKS ON A ROCKY OUTCROP OF THE MOUNTAINSIDE. A HUNDRED FEET AWAY I FOUND THE TRAIL WHICH WOUND IT'S WAY SAFELY UP AND AROUND THE MOUNTAIN. WHILE ON THE MOUNTAIN TOP I TURNED THE GPS OVER TO MARY TO LEAD THE WAY AND WE FOUND OUR SECOND TREASURE. 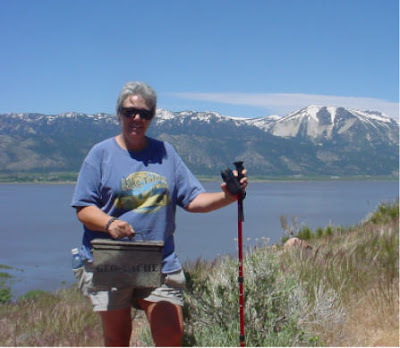 THE BENEFIT OF THE SEARCH WAS A BEAUTIFUL HIKE UP THE MOUNTAIN AND A MOST BEAUTIFUL SITE DOWN TO WASHOE LAKE AND ACROSS THE VALLEY TO THE SNOW CAPPED SIERRA NEVADAS ON THE OTHER SIDE. THAT'S WHAT IT'S ALL ABOUT !!! WE'VE CREATED A NEW PAGE ON OUR WEBSITE TO LOG OUR GEOCACHING HIKES.THE PICTURE ON THAT WEB PAGE IS A TREE WE FOUND AT THE TRAILHEAD OF OUR FIRST HUNT. A SILVER TREE IN THE SILVER STATE. TRACY SHAGER IS IN RENO, NEVADA FOR THE WOMAN'S NATIONAL BOWLING TOURNAMENT. WE MET TRACY POOLSIDE AT THE ELDORADO CASINO AND HOTEL DOWNTOWN. TRACY IS NOW THE TABLE GAMES MANAGER AT THE ISLE OF CAPRI IN MARQUETTE, IOWA, THE FIRST CASINO WE WORKED AT. TRACY IS FROM POSTVILLE, IOWA AND I CAN REMEMBER HER TRYING TO GIVE MY KIDS SWIM LESSONS. SHE FILLED US IN ON ALL THE STORIES FROM MARQUETTE, AND WE ASKED HER ABOUT ALL OUR FRIENDS THAT STILL WORK THERE OR HAVE MOVED ON. THE BEER WAS ICE COLD TOO. IT'S ALWAYS GREAT TO SEE FRIENDS FROM HOME !!! !